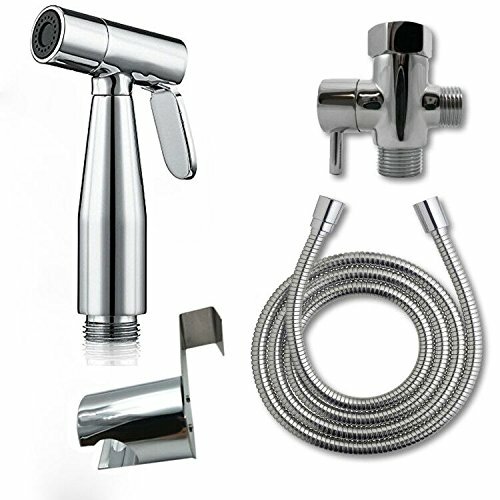 This IUME bidet sprayer for toilet is the best choice for your daily personal hygiene, it comes with all components for standard installation such as bidet sprayer head,3 way tee adaptor, stainless steel hose,bracket,hook etc. We even provide tape,screw,washer etc small parts for you. You have no need to purchase any other parts from local hardware store.Meanwhile,it's so easy to install this bidet toilet sprayer combo, no plumber needed, you can finish installation within a few minutes, only need simple tools such as wrench or screwdriver etc. Our upgraded design can guarantee leak proof, both ceramic and brass disc cartridge constructed T adapter makes this handheld bidet spray set more durable and solider,ajustable water flow function brings you comfortable self cleaning experience. Solid and top premium material with precise surface plating process is obviously better than conventional bidet brand.100% quality guarantee policy and 100% money back! 3) Use washer attached in the packaged box, the bigger for tank and water supply connection, the smaller (normally already in the hose end) for bidet hose and bidet sprayer head. 4) Turn off the 3- way tee diverter after each use. 4) Suitable for the US and Canada family only, not universal for Europe or other countries/area. ►THE END TO CLOTH DIAPER CLEANING MESS! - Using cloth diapers is a thoughtful, eco-friendly choice but cleaning them can be a real headache. Well, not anymore! IUME cloth diaper sprayer is here to save the day! Our cloth diaper sprayer's one-hand ergonomic design allows you to clean the diapers quickly and easily, and the smooth, steady water pressure from its polished chrome nozzle washes away any mess without over spraying or leaking! ► FULLY COMPLETE, EASY TO INSTALL KIT! - You do not need to be technically inclined in order to set up your diaper sprayer; it comes with all necessary accessories so that you can install it effortlessly in a matter of minutes! ►SO MUCH MORE THAN JUST A DIAPER SPRAYER! - You can also use it as a toilet seat cleaner, a bidet sprayer, a tub, shower, sink or faucet washer or even as a water hose to give your dog a good wash! ►SAVE WATER - Top Premium Brass T Valve-Ceramic And Brass Disc Cartridge Constructed Helps To Control And Adjust Water Supply Easily. Save Water And Save Your Money. ► NEW AND IMPROVED HOSE - You told us and we listened! Our NEW and IMPROVED hose is made from leakage proof high grade EPDM wrapped in a nylon braided hose for guaranteeing against leaks and stabilizing water pressure. This is similar design that is used for all faucet supply lines including showers, faucets, and hot water tanks. The external hose is made with double interlocking premium stainless steel that is flexible, stretched folded without any problems and is kink-free. NO MORE LEAKAGE! If you have any questions about this product by IUME, contact us by completing and submitting the form below. If you are looking for a specif part number, please include it with your message.